When a two-row SUV just doesn’t cut it, you need something that’s bigger than a giant. You need an Atlas — the 2018 Volkswagen Atlas, to be specific. With comfortable seating for up to seven passengers, or nearly a hundred cubic feet of storage space with the seats folded, the Atlas is big enough to handle any task at a price that resembles lesser SUVs like the 2018 Dodge Durango. For virtually the same price, you’ll get superior fuel economy, more interior space and the level of comfort, sophistication and quality that only Volkswagen can deliver. We invite you to experience the 2018 Atlas for yourself. Stop by our showroom for a test drive, or browse our new car inventory to find the Atlas with the colors and options you like best. 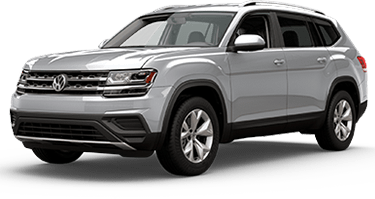 Thanks to an efficient, turbocharged four-cylinder engine, the 2018 Volkswagen Atlas can easily achieve more than 20 MPG in the city, and up to 26 MPG on the highway. 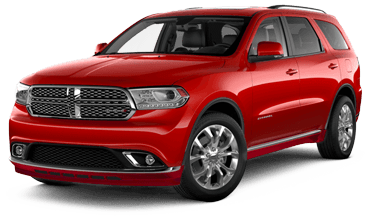 For its part, the 2018 Dodge Durango cannot eclipse 20 city MPG. Or, if fuel efficiency is less crucial while performance is a must, you can upgrade to a mighty V6 engine in the Atlas, for a maximum towing capacity of up to 5,000 pounds and 276 horsepower. When equipped with 4MOTION® all-wheel drive, the 2018 VW Atlas comes with Active Control. Active Control lets you select a driving mode for the conditions ahead — including rain, snow, rough roads and smooth highway cruising — and adjusts the chassis accordingly. While both vehicles are available with optional active driver assistance features, the Insurance Institute for Highway Safety feels the Atlas is better equipped to protect you in an accident. That’s why the IIHS gave the 2018 Volkswagen Atlas their 2017 Top Safety Pick award, having rated the Atlas “Good” in all crash test areas. By contrast, the 2018 Dodge Durango won no IIHS Safety awards, and received a “Marginal” rating in the driver’s side small overlap crash test. At Volkswagen, making iconic vehicles that last and last is just what we do. From the timeless Beetle and Minibus that set the standard, to the enduring practicality of the Jetta and Golf, to the modern marvels called Tiguan and Atlas, they all share one thing in common: legendary German engineering. It’s not just for luxury sedans and sports cars anymore! Volkswagen means “People’s Car” in German, and that’s all we do: Make reliable, efficient, beautiful cars perfect for the realities of day-to-day driving. Find yours today at Carter Volkswagen! You’ll find our team delighting customers in our showroom at 5202 Leary Avenue Northwest, Seattle, WA 98107. Our monthly new car specials mean we’re always finding new and exciting ways to help you save on a brand new Volkswagen.